To establish a diamond’s quality, jewelers examine each of the 4 Cs – cut, clarity,color and carat weight. The combination of the 4 Cs determines the value of a particular diamond. First, don’t confuse diamond “cut” with “shape.” Shape refers to the general outward appearance of the diamond, (such as round, emerald, or pear). When a diamond jeweler says “cut,” that’s a reference to the diamond’s reflective qualities, not the shape. Diamond cut is perhaps the most important of the four Cs, so it is important to understand how this quality affects the properties and values of a diamond. 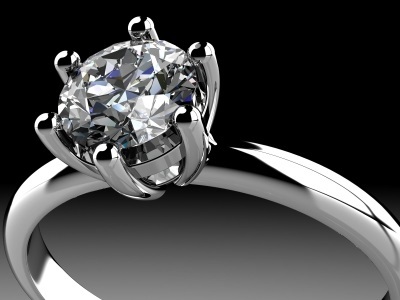 When we talk about Cut as a value factor, we’re also talking about the proportions, symmetry and finish of a diamond. A good cut gives a diamond its brilliance, which is that brightness that seems to come from the very heart of a diamond. The angles and finish of any diamond are what determine its ability to handle light, which leads to brilliance. If you think about the incredible amount of pressure it takes to create a diamond, it’s no surprise that many diamonds have inclusions on the inside (clouds, feathers, included crystals) or surface blemishes (scratches, polish lines, extra facet). Diamonds with no or few inclusions and blemishes are more highly valued than those with less clarity, not just because they are more pleasing to the eye, but also because they are rarer. When jewelers speak of a diamond’s color, they are usually referring to the presence or absence of color in white diamonds. Color is a result of the composition of the diamond, and it never changes over time. NOTE: Fancy color diamonds do not follow this rule. These diamonds, which are very rare and very expensive, can be any color from blue to green to bright yellow. They are actually more valuable for their color. To grade ‘whiteness’ or colorlessness, most jewelers refer to GIA’s professional color scale that begins with the highest rating of D for colorless, and travels down the alphabet to grade stones with traces of very faint or light yellowish or brownish color. The color scale continues all the way to Z. A carat is a unit of measurement, it’s the unit used to weigh a diamond. One carat is equal to 200 milligrams, or 0.2 grams. The word “carat” is taken from the carob seeds that people once used in ancient times to balance scales. So uniform in shape and weight are these little seeds that even today’s sophisticated instruments cannot detect more than three one-thousandths of a difference between them. NOTE: Don’t confuse “carat weight” with “karat,” the method of determining the purity of gold.